I sink into my plush cream leather sofa on the Mumbai studio set of the new CNBC-TV18 show, All For This One Moment, and observe the complicated grid of pulsating lights, wires and pipes overhead. A jib with camera attached swoops down in an arc, narrowly missing another audience member’s turban. He is promptly shifted somewhere else. The area that we are sitting in is designed to look like a Lufthansa business class lounge, with its grey carpet and frosted glass coffee tables. These are arranged in a semicircle around an elevated wooden stage, where Shereen Bhan is holding court as a very regal commander in chief. She is dressed in fitted black pants, a leaf green shirt and sleek pumps. Her hair has been ironed straight for this episode and she wears minimal jewellery (a Montblanc charmbracelet is the only visible piece, besides her hardy metal Swatch). This is the Shereen that we know from our TV screens, the anchor of shows like Young Turks and India Business Hour, the person who has interviewed business leaders like Bill Gates and politicians like Benazir Bhutto and gotten them to expose the insides of their brains and their hearts. Tomorrow the Verve team will transform her into a princess for our ultra-feminine cover look, complete with diamonds and soft cascading curls. She will giggle and confess that she’s never worn nail polish before, roll her eyes when she sees the heels we’ve picked out, and cringe in embarrassment when Malli from her production team whips out her cameraphone and shrieks “Boss, is that really you?” Tomorrow, Shereen will tell me about how she sang for a rock band in Pune during her college days and how she still “screams her lungs out to” Alanis Morisette on long drives in Delhi with her girlfriends. She will disclose her love for gardening, cleaning her home, and Indian fiction and wonder if she might be considered “hugely boring.” But all this is in the future. For now, Ms Bhan is the consummate professional, reading her research printouts, crisply issuing orders and marshalling the organised chaos on the set into the magic of another perfectly recorded episode. Twenty-four hour business television in India is approximately a decade old. Viewership has galloped along with the rapid growth of the economy. CNBC-TV18 is the leader of the pack; it is in fact, India’s most watched English news channel, and it has two reigning superstars. Udayan Mukherjee is the king of the day with his scholarly background and intense focus on markets. Shereen Bhan is the queen of the night, as she demystifies the corporate world with close-ups of its inhabitants. Udayan tracks the action while it happens; Shereen brings us the context and rationale behind the action. When Udayan comes on air, we are at work, mostly with the volume off. We may glance upwards at the TV occasionally and un-mute if the news is particularly bad. When Shereen comes on air, we are at home after a long day in the urban battlefield, tiredly removing our socks and wondering what to do about dinner. We turn the volume up, partially to drown out the saas-bahu sountrack playing at the neighbours, but also because frankly, Shereen’s voice at the end of a long, hard day is pretty damn soothing. All of this makes Udayan our knowledgeable acquaintance, but someone that we might not have anything to say to if we meet them in an elevator. Shereen on the other hand, is our friend – the Shah Rukh to Udayan’s Amitabh. She is the one that random strangers walk up to at airports and chat with; that families in Ahmedabad “adopt” and send regular Diwali cards to; that lovestruck fans blog about on the internet. There’s something about Shereen. “She had star quality right from day one,” recounts Sanghvi. “Her first job was to warm the audience – chat with them and tell them how to respond, and clap on cue. Even though she was still in college, she had an ability to connect to people and make them open up to her, almost effortlessly.” This is an ability that she has now honed to a fine art. I witness this modus operandi first hand, as the taping begins. Her guest, HCL founder Shiv Nadar starts off by being monosyllabic, but Shereen deftly fills in the blanks and references their previous conversations to warm him up. He is visibly moved while talking about his mother, and she spots this and builds upon it. Slowly, Nadar’s body language changes, a smile peeks out, and the conversation starts flowing rapidly. It is like watching an artist at work. Soon, she is rebuking him about poking fun at his spendthrift best friend (“That is not a good thing to say, Mr Nadar, on national television!”), teasing him about HCL’s missed opportunities (“You mean to say there is a third mistake that you made? Go on then!”), and urging him to use different examples to make his point (“We’ve heard the Patton story before, give us another one”). When former McKinsey MD Rajat Gupta’s videotaped message plays on screen, in which he recounts how Nadar had offered him a blank check for the school’s construction, Shereen exlaims, “Give me a blank cheque as well!” At the end of the show, she gifts Nadar a caricature of himself as the Godfather, his favourite movie. These strong people skills accompanied by a razor sharp mind and a capacity for hard work have taken Shereen on a whirlwind journey over the past decade. Her first job at UTV, where she worked alongside Karan Thapar, Tavleen Singh and Nafisa Ali, was merely the trailer for her starring role at CNBC-TV18, where she has spent eight years doing “absolutely everything” and picked up awards like FICCI’s Woman of the Year (2005) along the way. Today, as the executive editor of the channel at age 32, she is on top of her game and enjoying every moment of her success. Raghav Bahl, the TV18 group’s MD, and the man who interviewed Shereen for her job eight years ago, considers her as “Ms Reliable”, and she smiles when I tell her that. “Yes, I can never say no, and once I say yes, I commit myself fully to the job. Business reporting is not about glamour. It is back-breaking-stressful work. I tell anyone who enters the business today that you have to swallow your pride every single day.” We witness what Bahl refers to as her “ever-smiling, can-do” spirit at the Verve shoot. It is always hard for a TV person to be photographed. They are so used to movement that the absence of it becomes disconcerting. But Shereen adapts quickly. She works through the 10-minute lunch break (wolfing down just a pizza slice during one of the costume changes), and follows instructions perfectly until photographer Vikram Bawa is satisfied with the results. Vandana Malik, Executive Director of the TV 18 group, tells me that she is proud of Shereen’s success, but would like her to “keep some time for herself”, cautioning that “life will go by and one day, you’ll turn around and ask, did I spend time with family or friends, take the holiday that I needed?” Shereen agrees “On Sundays, I’m fidgety at home, because there’s no work. I shouldn’t crib but rather do something about it.” This might be her New Year resolution, perhaps. Meanwhile, her staff member Malli has popped in her head into the make-up room yet again. I take this as my cue to leave. As Shereen walks me to the exit, I ask her about her future plans. Narayan Murthy would like her to “become the first Indian business anchor on a global business channel like CNBC, New York.” Vandana Malik declares that within the TV18 umbrella, Shereen has carte blanche to do whatever she desires. But for Shereen herself, it’s still tunnel vision, at least for the near future. 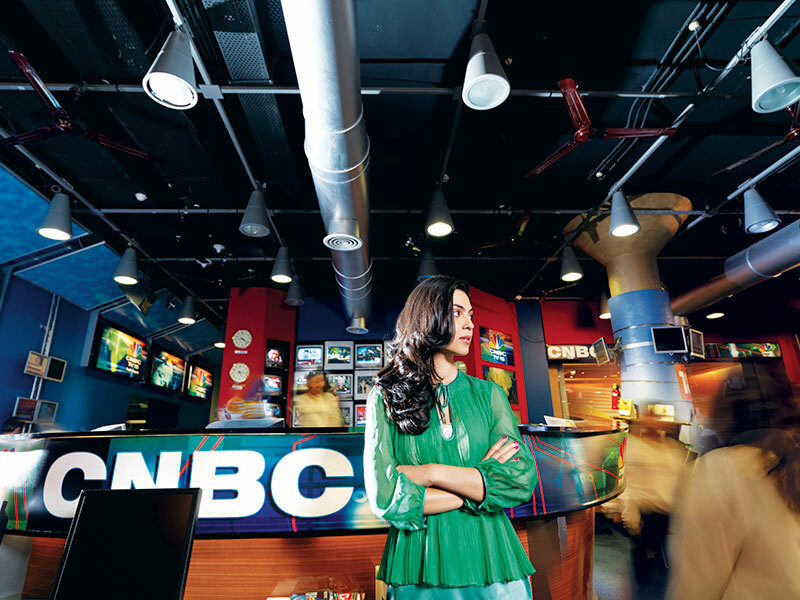 “I plan to keep on working on improving CNBC-TV18. But for the long term, I think I might want to work with kids. I do know that the day I get exhausted with TV, I will move completely away. It is not something that you can do part-time.” As she bids me goodbye, she promises that the next time she’s in Bombay, she’ll try and get out of the studio and do a heritage walk. All part of the New Year resolution, Shereen. Remember, 2009 is just around the corner. We’ll be watching.